Because moose are built to live in cold environments, our warming climate puts them at increased risk of overheating, leading to malnutrition and lowered immune systems. Making matters worse, ticks and other parasites that harm moose thrive with rising temperatures. These threats -- along with habitat destruction from logging and mining in the North Woods -- are pushing moose to the brink in the upper Midwest. In fact, Minnesota has already lost more than half of its moose, and scientists have warned that the animals could disappear from the state within five years if the trend isn't reversed. Fortunately there's still hope for preserving this piece of the region's natural heritage: In response to a petition from the Center, the U.S. Fish and Wildlife Service recently announced that moose in Minnesota, Wisconsin, Michigan and North Dakota may warrant federal protection. Join others in defending these beautiful giants of the North Woods. 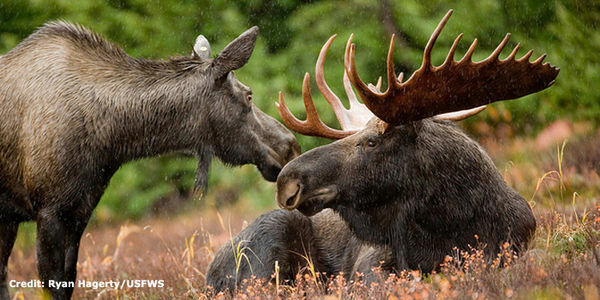 Urge the Service to quickly move forward with protections for moose. I'm writing in response to your June 3 announcement that moose may receive protections under the Endangered Species Act. I'm saddened that these magnificent animals are in such big trouble but relieved that help could be on the way. As you know threats ranging from climate change to habitat destruction to parasites are taking a devastating toll on moose in the upper Midwest. Protection under the Act for moose would highlight the harm caused to them and other wildlife by failing to adequately address greenhouse gas emissions. And it would bring additional federal dollars for moose research and provide critical habitat protections needed to help them weather our warming world. Let's give these majestic animals the best chance at recovery by promptly moving forward with federal protections.